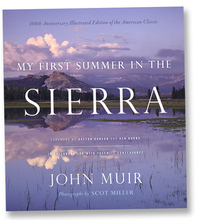 One hundred years ago, naturalist John Muir published his most famous work, My First Summer in the Sierra. (Here he is posing for B. Greene, just two years before that). It’s one of those books that has become part of the nature/environmental canon, alongside Thoreau, Rachel Carson, Henry Beston, John Burroughs, Aldo Leopold, and Edward Abbey. That is to say, it’s one worth reading, and if that’s piqued your interest, there’s a new illustrated edition out today, with photography by Scot Miller. The text, of course, can be had anywhere. What this edition offers is seventy-two gorgeous photographs, taken over the past twelve years. Flora, fauna, landscape -- the same panoramas that Muir himself viewed. What’s more, several pages from Muir’s “Sierra Journal” manuscript (the original of which is housed at the Holt-Atherton Special Collections, University of the Pacific Library) are reproduced herein; he had lovely handwriting, certainly neater than Thoreau’s scrawl. Several of Muir’s sketches are also seen here for the first time in print. Miller, has been involved in three other photobooks of this nature (no pun intended): Walden: 150th Anniversary Illustrated Edition of the American Classic, Cape Cod: Illustrated Edition of the American Classic, and First Light: Five Photographers Explore Yosemite’s Wilderness. He and his wife own and operate Sun to Moon Gallery, a fine arts gallery in Dallas, Texas. He will be doing several book-related presentations and signings, particularly in California and Texas, from now until the book’s formal centennial in June. Visit the book’s website to read more, see some of the stunning photography (limited edition prints are also available for sale), and/or watch a book trailer. 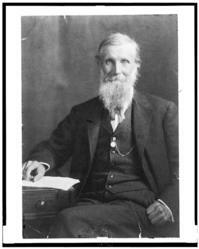 One hundred years ago, naturalist John Muir published his most famous work, My First Summer in the Sierra. (Here he is posing for B. Greene, just two years before that). It's one of those books that has become part of the nature/environmental canon, alongside Thoreau, Rachel Carson, Henry Beston, John Burroughs, Aldo Leopold, and Edward Abbey. That is to say, it's one worth reading, and if that's piqued your interest, there's a new illustrated edition out today, with photography by Scot Miller. The text, of course, can be had anywhere. What this edition offers is seventy-two gorgeous photographs, taken over the past twelve years. Flora, fauna, landscape -- the same panoramas that Muir himself viewed. What's more, several pages from Muir's "Sierra Journal" manuscript (the original of which is housed at the Holt-Atherton Special Collections, University of the Pacific Library) are reproduced herein; he had lovely handwriting, certainly neater than Thoreau's scrawl. Several of Muir's sketches are also seen here for the first time in print. Miller, has been involved in three other photobooks of this nature (no pun intended): Walden: 150th Anniversary Illustrated Edition of the American Classic, Cape Cod: Illustrated Edition of the American Classic, and First Light: Five Photographers Explore Yosemite's Wilderness. He and his wife own and operate Sun to Moon Gallery, a fine arts gallery in Dallas, Texas. He will be doing several book-related presentations and signings, particularly in California and Texas, from now until the book's formal centennial in June. Visit the book's website to read more, see some of the stunning photography (limited edition prints are also available for sale), and/or watch a book trailer.